The J.B. Crofoot Company didn’t manufacture tools simply for practicality. They made their items with a high-degree of quality and crafted them with aesthetics in mind. One of the best examples of their workmanship is the No. 525 Paper Fastener. The No. 525 was made from nickeled iron and steel. It measures 5.25″ L x 2.75″ W x 5″ H and weighs 2 lb 6 oz empty. 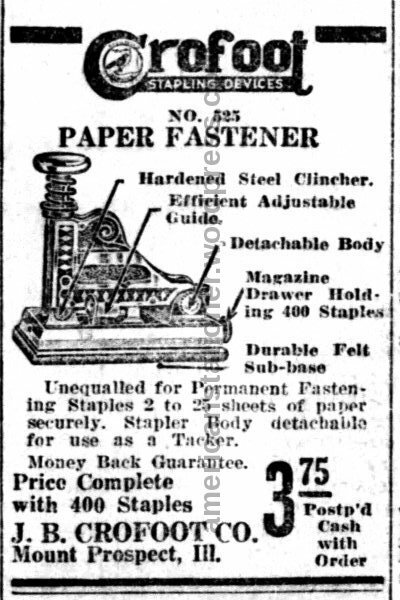 It used strip staples and is one of the last such machines introduced that used these types of staples. Among the features found on this machine are an adjustable paper stop mechanism, staple storage drawer on the base, and a removable pivot pin (labeled PULL on the photo) that allowed the No. 525 to be used as a tacker. This fastener was patented under US patent number 1663242. This patent was filed on July 1, 1926 and granted on March 20, 1928 to John B. Crofoot. Oddly, on close inspection of the No. 525 it can be noted on one side that it is stamped “FOREIGN & OTHER PAT PENING” [sic]. On the other side it is stamped “PAT’D U.S.A. 4-27-17 3-11-24”. These two dates reference patents 1224075 and 1486638 and/or 1486639. These last two both having been granted on April 27, 1917 to John B. Crofoot. These patents reference other fastening machines produced by the J.B. Crofoot Company. With a bit more examination I have found reference to patent 1663242 stamped on the fastener. If you remove the staple storage drawer from the base and you look inside you can see “PAT. 3-20-1928 1663242” stamped on the inside bottom of the base. The present invention is directed to improvements in cushion caps for percussion operated tools such as stapling machines and the like, and has for its general object the provision of a device of the kind described that will be efficient in operation, of comparatively low manufacturing cost and particularly adapted to save the hand of the operator from pain or discomfort when operating the device. Another object of my invention is to provide a cushion cap for stapling machines with means permitting its almost continuous use without injury to the comparatively soft hands of those engaged in office work. The No. 525 was advertised in 1933. That’s the only year for which I can find ads of any kind. The cost was $3.75 which when adjusted for inflation comes to $68 in 2014. 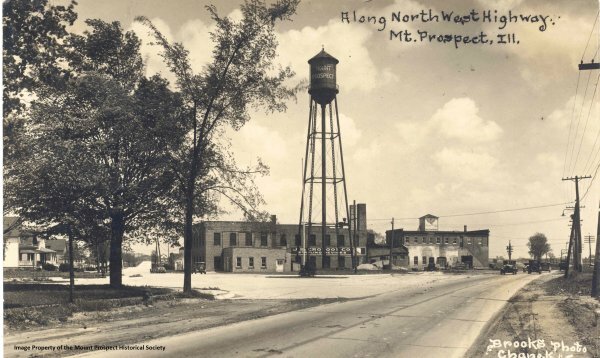 The patent was filed in 1926 but this is the year they started the move from Arlington Heights to Mount Prospect. This may have delayed the introduction of this model while the company set up and retooled a new factory. 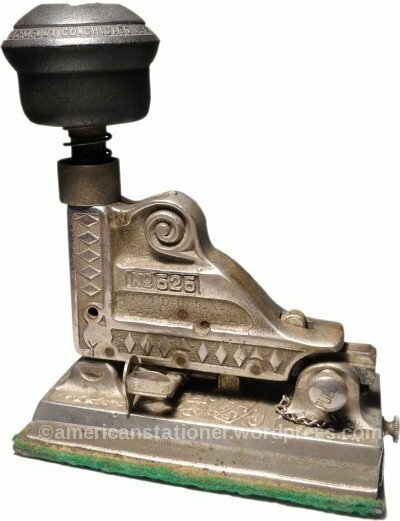 While the Hotchkiss No 1 was still sold and marketed in the 1930’s it had been close to a decade since a strip stapler had been newly introduced to the trade. By this time the modern frozen wire cohered staples was the technology everyone was using making the No. 525 obsolete upon introduction. If the No. 525 had been introduced earlier it might have stood a chance at success. The J.B. Crofoot Company was started in 1905 in the basement of Mr. and Mrs. Crofoot’s private residence in Milwaukee. They shortly moved to Chicago and again set up the company in their private residence. It would appear that their neighbors were not overly enamored of the idea of a machine shop operating out of someone’s house and there was likely a complaint or two about noise. J.B. Crofoot in 1920 incorporated the company and relocated to a factory in Arlington Heights, Illinois and in 1927 they moved to their final location in Mount Prospect, Illinois. J.B. Crofoot Company was located in Mount Prospect at least until 1957 after which time records can no longer be found. John B. Crofoot was born April 18, 1862 in Turin, New York. he completed his education in Rochester, Minnesota and became a teacher there. He moved back to New York where he became a school principal in Port Leyden. It was there he met Mary Hills, another teacher, and they married on December 2, 1886. After marrying they moved to New York City where John became involved in insurance and was a life insurance solicitor until the turn of the century. After living in New York City for several years the family moved to Beaver Dam, Wisconsin. After this, they lived in Milwaukee, Chicago, and finally in Arlington Heights. J.B. Crofoot died September 15, 1936. Born on December 3, 1888, Elisha H. Crofoot was the son of J.B. Crofoot and Mary Hills Crofoot. Elisha was very much a part of the family business eventually running the day-to-day operations of the company. He contracted meningitis in 1933 and died on February 13, 1934. He left behind a widow and two children. It was Elisha’s death that forced John to take back over the day-to-day operations of the company and it was believed that was one of the major factors leading to his death. Mary Hills Crofoot, the wife of John B., was born on February 1, 1863. After the death of her husband she served for a time as president of J.B. Crofoot Co but ended up selling her controlling interest to her nephew C.A. Hills. Mrs. Crofoot served as secretary to the board of J.B. Crofoot until the time of her death. She died on March 31, 1946 after a heart attack. To Lindsay Rice, Executive Director of the Mount Prospect Historical Society. I can’t thank her enough for taking the time to send me copies of photos and to share what information she had on the J.B. Crofoot Company. I hope the information I’ve posted here and the files I’ve shared with her will help the Society in documenting their past.